As far as I'm aware, the star itself being the cause has been ruled out. A star can only change brightness by changing size (which is far too slow) or by changing temperature (which is too slow and doesn't match spectral observations). A star that rapidly dims without major changes in its spectrum is being blocked by something in front of it. How would my flare or black hole suggestions compare? There is a distinct maximum brightness with only minor variations, with irregular but sharply defined dips. Small stars with strong magnetic fields can be highly variable, but it's hard to see how such activity would just intermittently dim the star, and do so by such large amounts. A black hole would cause a very smooth and uniform variation, and a large amount of material orbiting the black hole would form an accretion disk with its own obvious emissions. If "far too much" is the best argument against comets, then I'd say the continuum between that and your "orbital snowstorm" is the best contender... at least in this thread. Haven't looked into it elsewhere, after all. In other interesting news. Radio telescopes have detected a repeating Fast Radio Burst source. Haumea appears to have a ring. Ross 128 has a planet in the habitable zone. The nice thing about Ross 128 is that, while it is a red dwarf, it doesn't have all the awful flares. The viability of habitable plants around red dwarfs is a huge question, since red dwarfs make up such a huge majority of stars in our galaxy. Mars Reconnaissance Orbiter finds buried water ice on Mars. This isn't new, but I found it interesting. Kip Thorne and the scientific team who worked on the black hole visualization for the movie Interstellar published a paper describing how they came up with it. The top curve over the black hole is the top of the accretion disk (on the far side from the viewer) warped around the event horizon; the small lower curve is the bottom of the disc from the far side warped around it. Ahoy, this is an old thing but it's very cool. The Curiosity probe took a bunch of hi-res photos on its way down to the planet Mars. Some unsung genius took them and merged them into a video. Select individual groups to more clearly view each orbit. It's also just a nice demonstration of the orientation of our solar system relative to the galaxy: the plane of our solar system is tilted almost 90 degrees on an axis pointed almost directly at the center of the galaxy. I thought it was 60 degrees or so, so I looked around a bit and found this among some other sites that described the same or similar. But in any case, that's an awesome simulator, Arioch. Thanks for posting it. 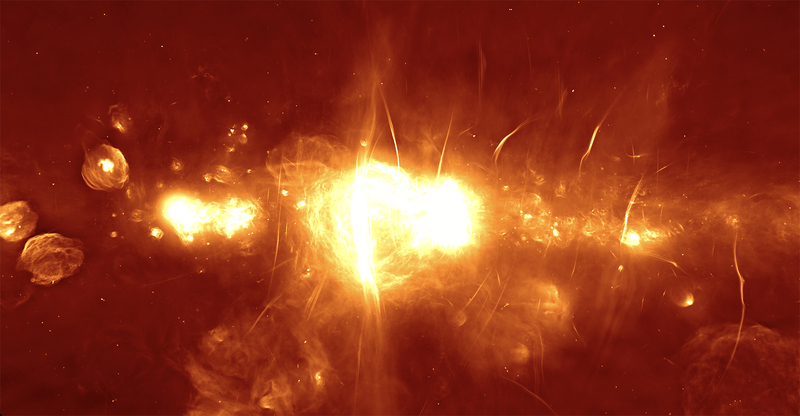 Last month this South African MeerKAT radio telescope image was released. It shows our galaxy’s central region at ~26,000 lightyears. MeerKAT will be part of a larger international Square Kilometre Array (SKA) in the Karoo (“thirsty land”) region of Northern Cape province. The bright x-ray feature in the middle outshines Sagittarius A*, which can only be imaged in the radio spectrum. The core region is a kind of gateway to hell: it packs a supermassive black hole with over 4 million times more mass than the sun, which is itself orbited by at least one other black hole with ~1300 solar masses. Those "radio filament" structures are very curious, especially that they are nearly all oriented vertically, from galactic north to south. Sagittarius A* is theorized to have potentially thousands of black holes within about a parsec of it, as a sort of hellish black hole Oort Cloud. At least a dozen of these have been recently identified by a Chandra X-Ray survey. This week's PBS Spacetime describes an important recent paper derived from the observation of the recent neutron star merger. In brief summary, because the neutron star merger was observed both optically and through gravitational waves, it was possible to compare the intensity of the two measurements to see whether the universe has additional dimensions. One proposed theory of gravity suggests that if there are more than three spatial dimensions, having effects of gravity impact these extra dimensions could account for why it seems weaker than the other forces, as well as other observed effects (like the apparent acceleration of the expansion of the universe). If so, the gravitational waves should dissipate faster in (3 + x) dimensions than the light waves did in only 3. However, the observed measurement matched more or less exactly what you'd expect to find if there were only three physical dimensions. This is an exciting finding for a variety of its implications. Perhaps the least important of which is to prove that Outsider doesn't take place in our universe. Since the Outsider version of hyperspace is affected by the gravity from objects in "normal" space, this should result in a measurable increase in the falloff rate of gravitational waves. Which is not what was measured. 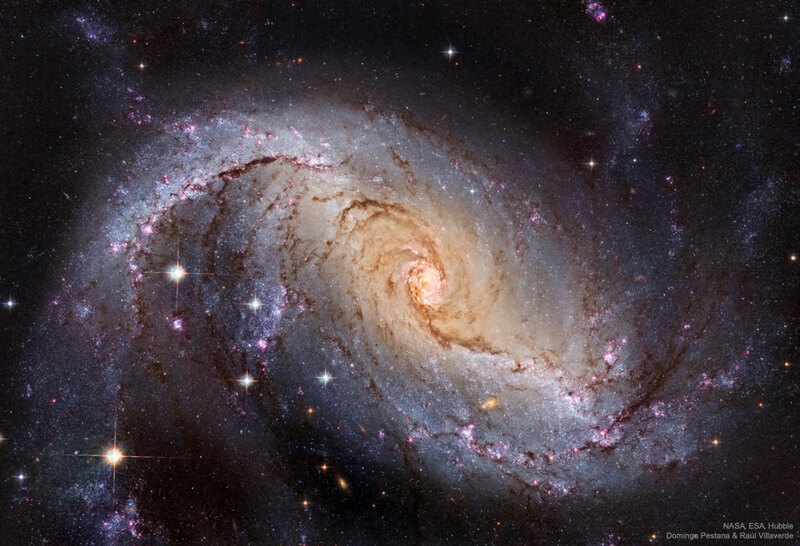 High-res images of galaxies never fail to blow me away. It's like staring into the infinite. Fast radio bursts (FRBs) are blasts of radio waves that last for only a few milliseconds but can contain as much energy as our sun puts out in decades. Over 50 have been spotted in space since they were first discovered in 2007, however we still don’t know what causes them. […] it most likely came from a galaxy called ESO 601-G036 located 120 million light years from Earth. Compared to 2.4 billion light years, 120 million is relatively close. Close enough for radio telescopes to have a noticeably better resolution, at least. You’re right of course. Still, it’s probably a good thing this isn’t happening (anymore) in our own galaxy. 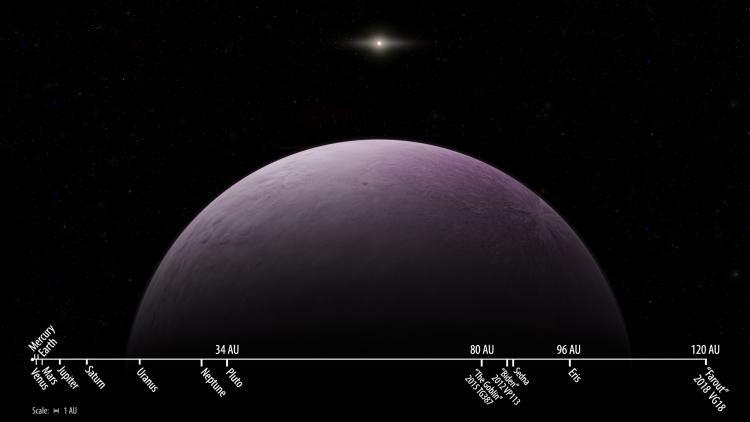 One more dwarf planet confirmed? How far are our Voyagers? Views from the Subaru telescope that led to the discovery of 2018 VG18. If I understand this "planet X" theory well, they should look for it in roughly the opposite direction of where all those dwarf planets align their orbit to, and still they're going for other KBO's in parts of the sky previous ones were found.